You are currently browsing the archives for the tag 'Raf Simons'. 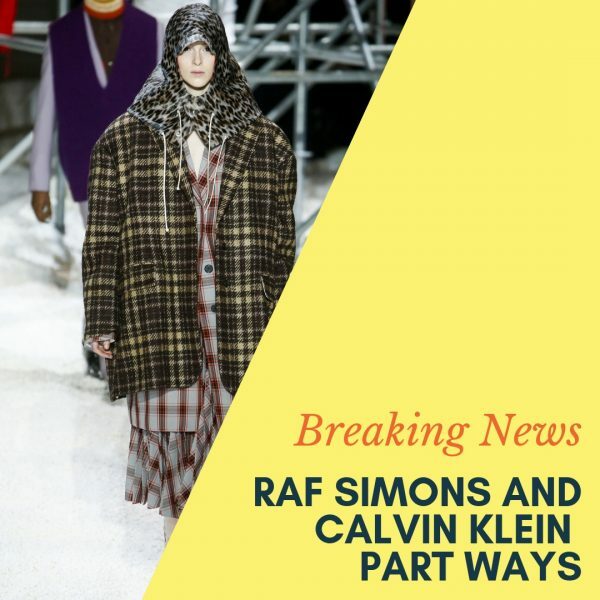 Breaking news last night: Raf Simons and Calvin Klein part ways after less than two years and eight months before the end of his contract. But the fashion world saw it coming after PVH (which also owns Tommy Hilfiger) chief Emanuel Chirico criticised last month the brand’s bumpy financial performance and high-fashion approach for which on the other side Simons won multiple awards from the Council of Fashion Designers of America during his time at Calvin Klein. 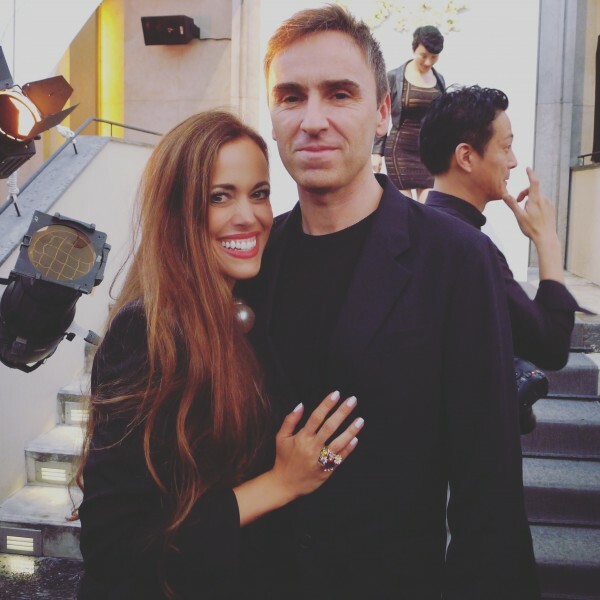 With Raf Simons in 2014 when he was still at Dior. Here lays exactly the problem. The Belgian designer, as well known for his cult menswear label as his well-regarded times at Jil Sander and Dior, was clearly committed to the cause of the iconic brand that consumers know for its denim, underwear and provocative marketing campaigns. He was given a multi-million-dollar salary and the title of chief creative officer. He oversaw all aspects of marketing and design for the American megabrand, a degree of control he did not have at Dior. 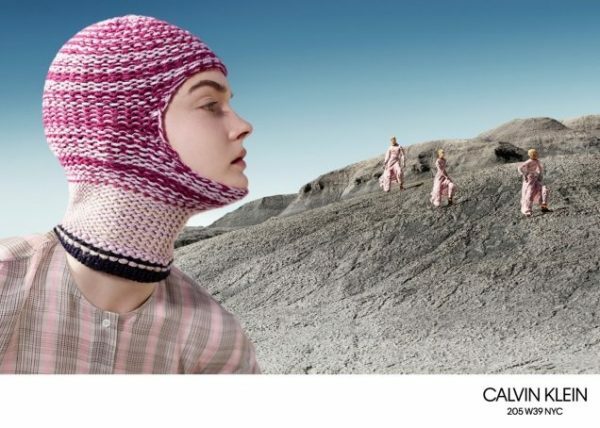 Unfortunately, the brand, that was renamed Calvin Klein 205W39NYC under Simons (sorry, but I have hated the name from the beginning), hoped to create a marketing effect through the high-end ready-to-wear collection for its lower-priced products. But this transformation didn’t take place. Personally speaking, I liked the looks Simons designed but I didn’t buy one single piece. Somehow I never felt the urge. For the American fashion industry, it is a big loss to see Simons go. But on the other hand, it is the only way to go. The brand will NOT even stage a runway show in February which is truly sad as his show definitely got a lot of international attention. #MyCalvins – bestselling items the brand will focus on even more. What will happen now with Calvin Klein? Needless to say, probably not another big designer name. 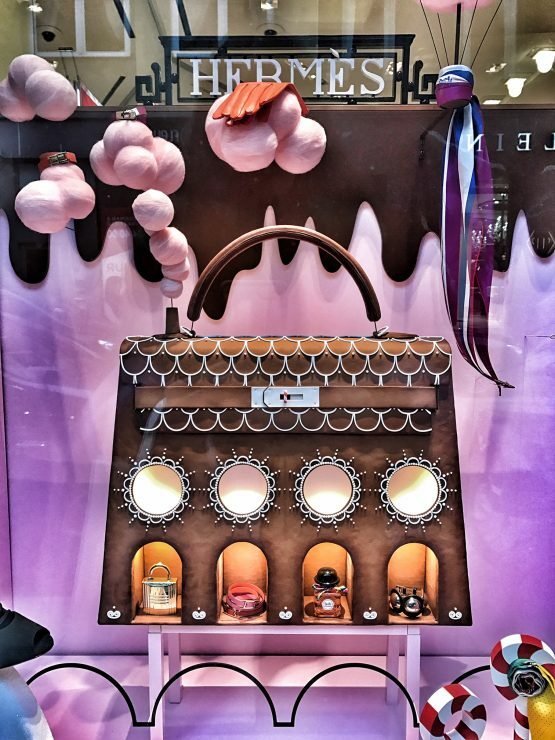 but a strategy that will shift the focus of its marketing campaigns from high-fashion to more affordable items. Cobbler, stick to your trade! 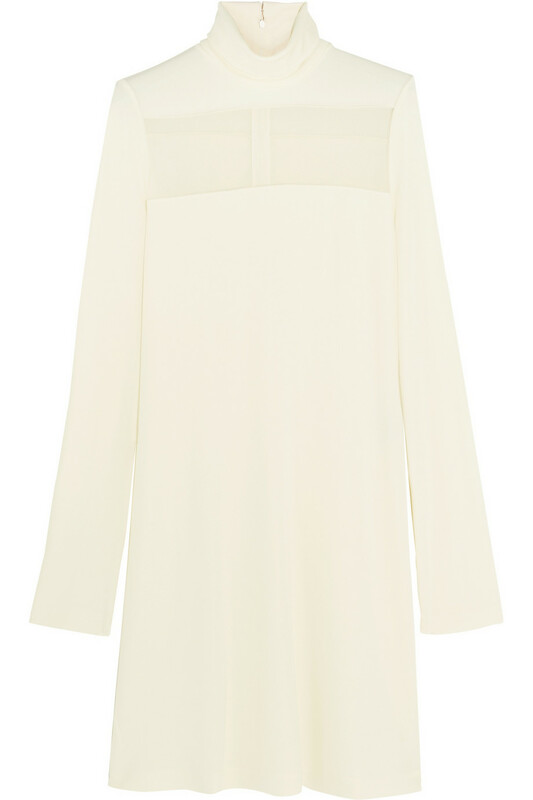 TO SHOP A LAST PIECE FROM RAF SIMONS FOR CALVIN KLEIN 205W39NYC, CLICK HERE PLEASE. 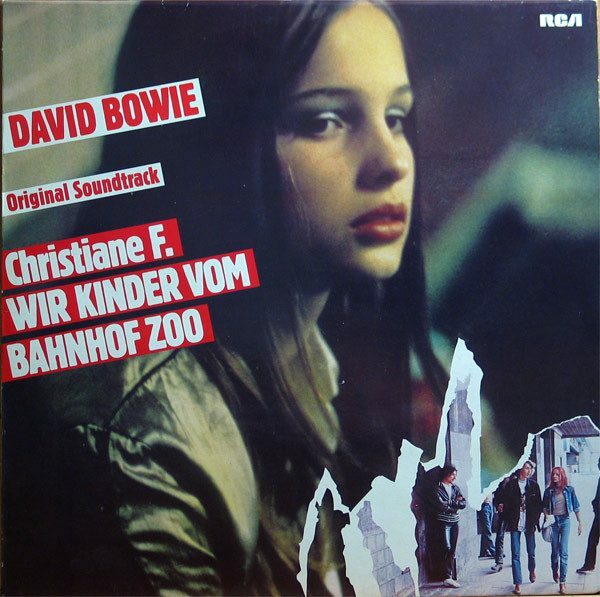 Raf Simons & Christiane F.
Growing up in Germany, «Christiane F. – Wir Kinder vom Bahnhof Zoo» (1978) was a must-read. This non-fiction book portrays the drug scene in West Berlin in the 1970s. It is about 13-year-old Christiane Felscherinow who lives in a multi-story, concrete social-housing building in a dull neighbourhood in the outskirts of West Berlin. She’s sick of living there and has a passion for rockstar David Bowie. After meeting the wrong people, Christiane starts taking LSD in addition to abusing pills, and later heroin. After her 14th birthday, she even stops going home and spends more and more time at Bahnhof Zoo, a large train and subway station notorious for the drug trafficking that takes place in its underpasses and back alleys. Christiane also starts to prostitute herself. Eventually she recovered and is still alive today, but most of her cohorts either died or are still addicts. In 1981, the film inspired by the book and directed by Uli Edel immediately acquired cult status (which it still retains today). It features David Bowie as both himself and the soundtrack composer, which gave the film a commercial boost. 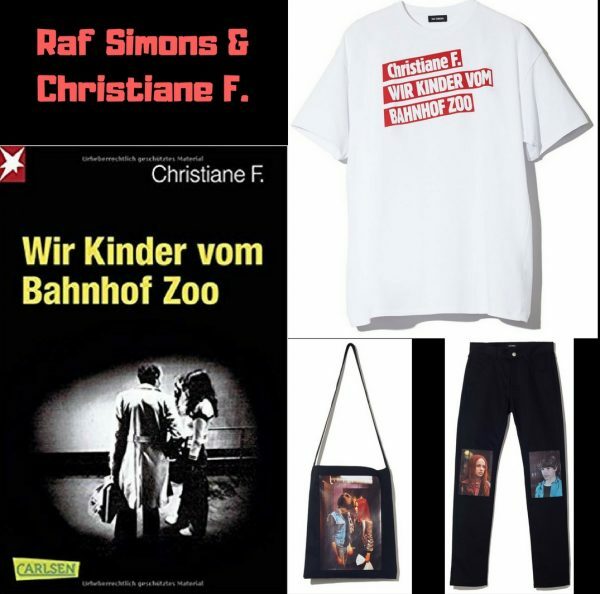 Now, Raf Simons, previous designer at Dior and now Chief Creative Officer at Calvin Klein besides his own line, seeked inspiration from this sad story and will launch its collaboration with the story «Christiane F. – wir Kinder vom Bahnhof Zoo». 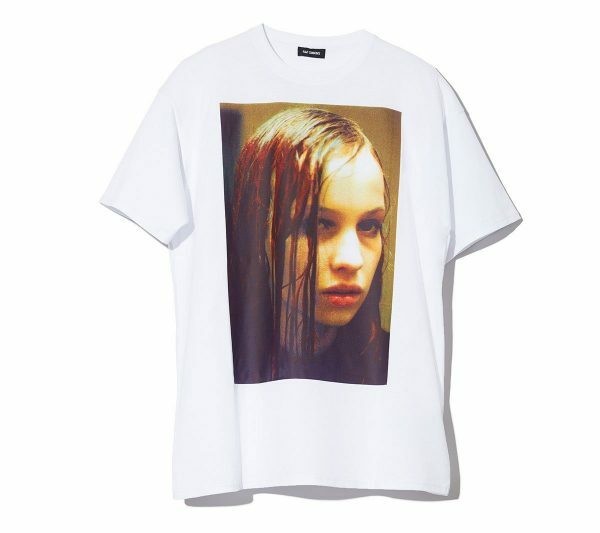 These exclusive pieces will be available at shop.rafsimons.com and in selected stores worldwide. With this project the designer will support organisations that help those in recovery from addiction. January blues? 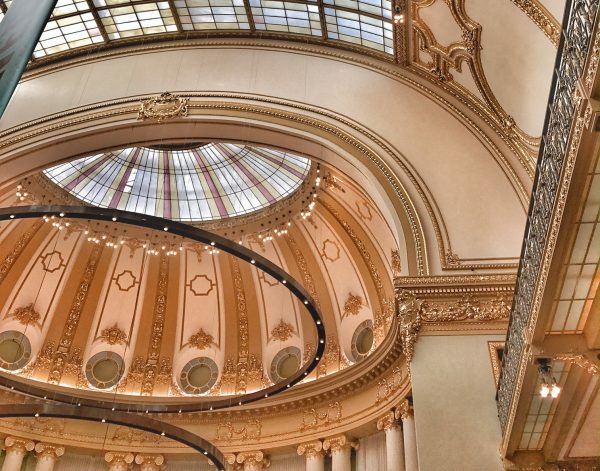 Forget those and plan a weekend trip to Antwerp. 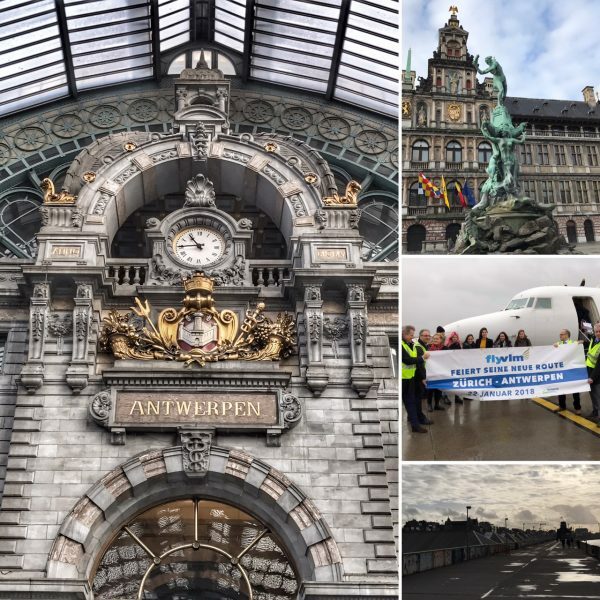 Last Monday, I was invited by Visitflanders to celebrate the launch of the first direct flight from Zurich to Antwerp. 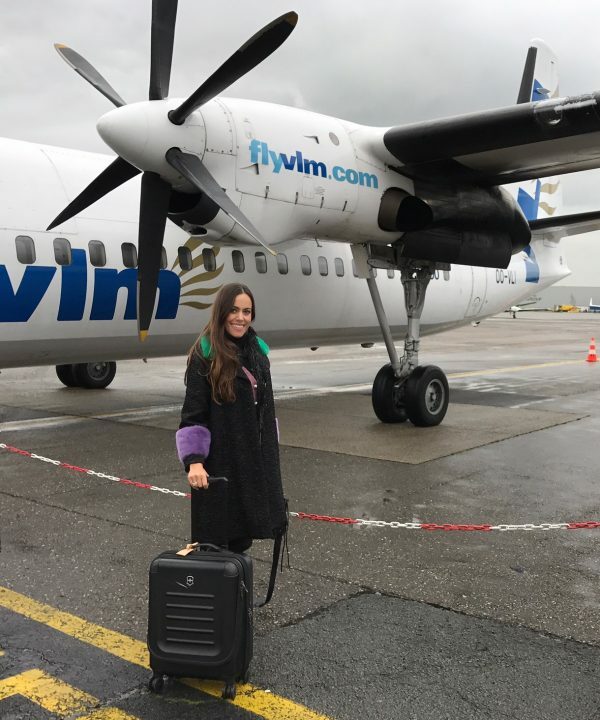 From now on, Flyvlm is heading on a daily basis to the Belgium hot spot. 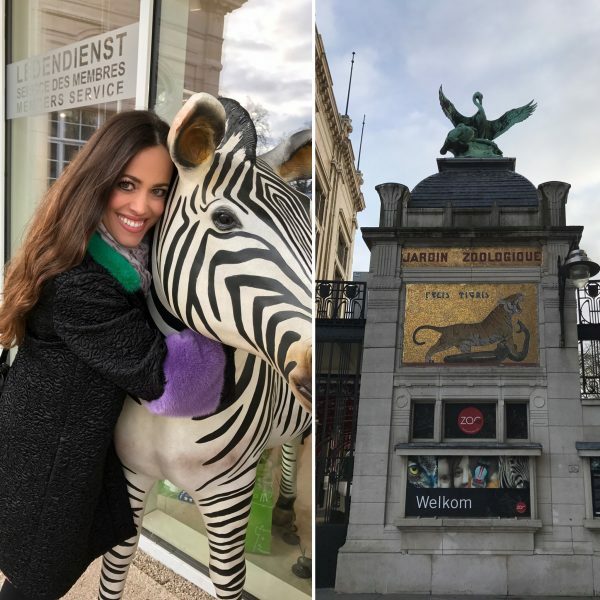 In 48 hours, I explored the city with a population just over 500,000 (of which I know surprisingly many:-)) and fell in love! Would you like to know why? Here you go! 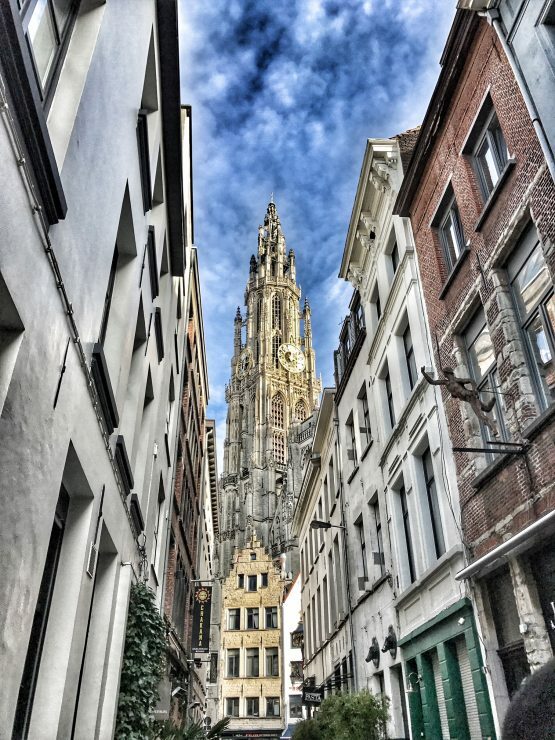 Brussels is Belgium‘s capital, but the second biggest city, Antwerp, is without a doubt the country’s hot spot of cool. 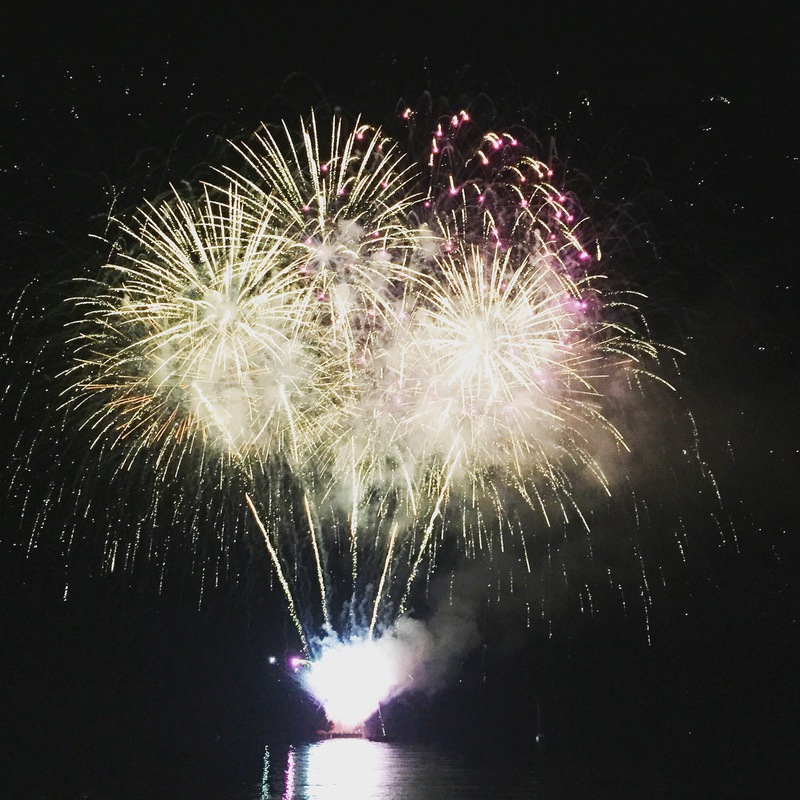 Best known for its gigantic seaport, diamond district, beer and being home to the baroque painter Peter Paul Rubens, it has a dazzling variety of attractions. And personally speaking one of the most important ones, is fashion! 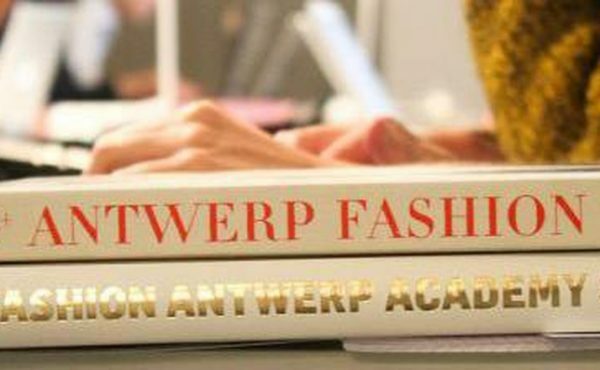 Antwerp’s renowned fashion school, the «Royal Academy of Fine Arts», is the prolific birth place of world-famous designers, of which six became known as «The Antwerp Six». 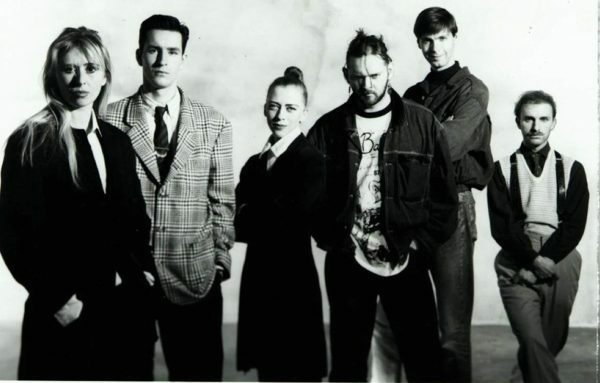 Under Linda Loppa, who now serves as the dean of Polimoda fashion school, Walter Van Beirendonck, Ann Demeulemeester, Dries Van Noten, Dirk Van Saene, Dirk Bikkembergs and Marina Yee graduated between 1980–81. In times where everything was a «little too much», the fashion collective presented a distinct, radical avant-garde vision for fashion that established Antwerp as a notable location for fashion design. The breakthrough occurred in 1986 as the group rented a truck and set out for London Fashion Week with their collections that immediately became a huge success. 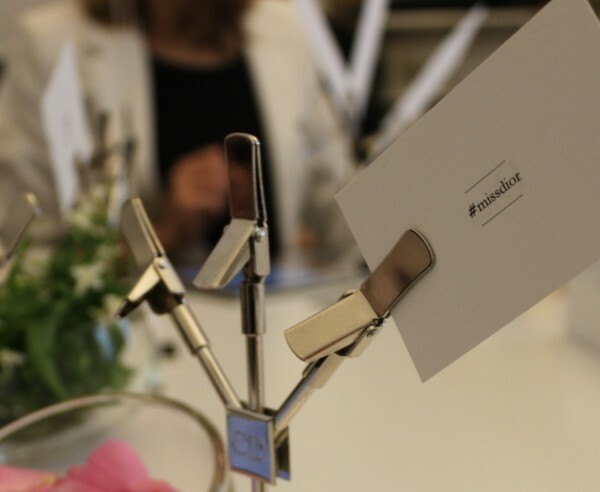 Within just three days, they found themselves stocked at Barneys, Bergdorf and Liberty of London, and propelled into the media stratosphere, even without Instagram. 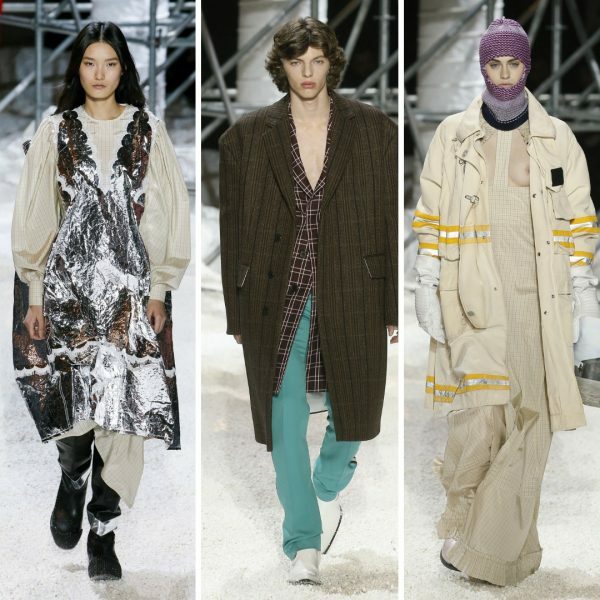 Martin Margiela, another Belgian contemporary, was not actually part of the group that showed in London, although he is often mistakenly described as one of the Antwerp Six; he had moved to Paris, initially working for Jean Paul Gaultier. 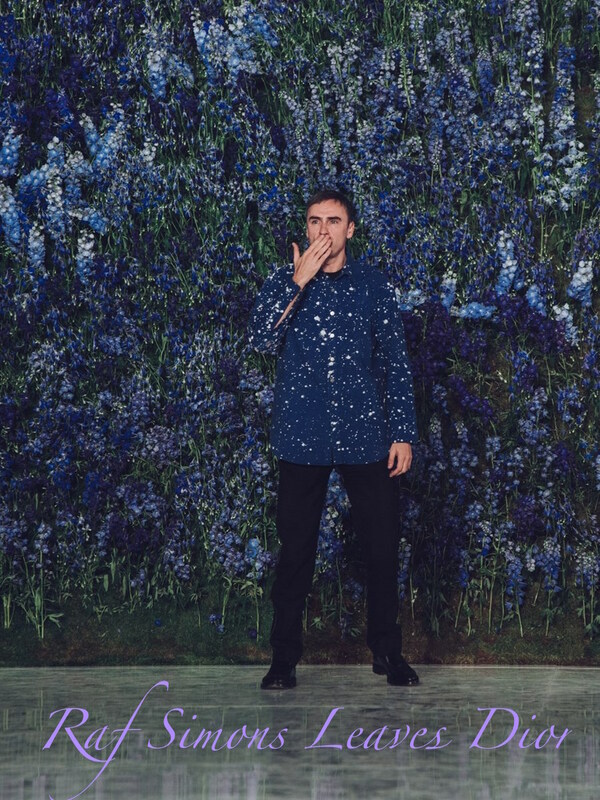 Another Belgium fashion celebrity is Raf Simons, who originally graduated in Industrial Design and Furniture Design from a college in Genk in 1991, when he got encouraged by Linda Loppa to become a self-trained menswear designer and launched his Raf Simons label in 1995. He began working as a furniture designer for various galleries, having previously interned at the design studio of Walter Van Beirendonck between 1991-1993. The latter took him to Paris Fashion Week and that was when Simons first saw a fashion show — Martin Margiela’s all-white show in 1991 — which inspired Simons to turn to fashion design. I love how all of them are related and that it brings it full circle. 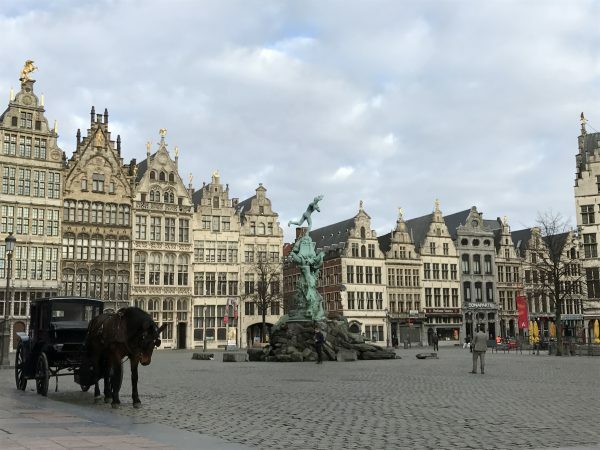 Despite being a powerful magnet for everyone from fashion moguls to art lovers and diamond dealers, Antwerp also retains an intriguing medieval heart with plenty of café-filled cobbled lanes, a riverside fortress and a truly impressive cathedral. Antwerp in a nutshell? These are the must-sees during your visit. 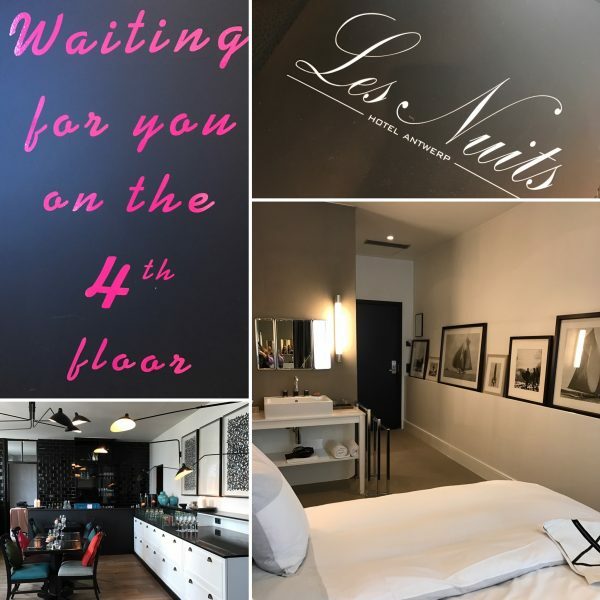 Located on the fourth floor, this little boutique hotel sits on the edge of Antwerp’s Fashion District and is perfectly located in the city. Every room has its own design. The service is extremely friendly and the food is healthy and amazing! A home away from home. The luxury Apartment with hotel service at Graanmarkt 13 is designed by Vincent Van Duysen and is a warm and welcoming home in the heart of Antwerp. It is the place where Mario Testing or Tim Burton are staying when they are in town. The top floor used to be the home of the concept store’s (located beneath) founders Tim and Ilse, but is now open for all. The price per night for the full apartment is € 1.300 (it is absolutely worth the money!). You get a spacious loft for up to 6 adults with 4 bedrooms and 2 bathrooms, wifi/internet, and breakfast included. Café Restaurant Bourla is housed in a majestic building on Graanmarkt, next to the Apartment. Yet the atmosphere is casual, the prices are decent and the Belgium food is amazing. 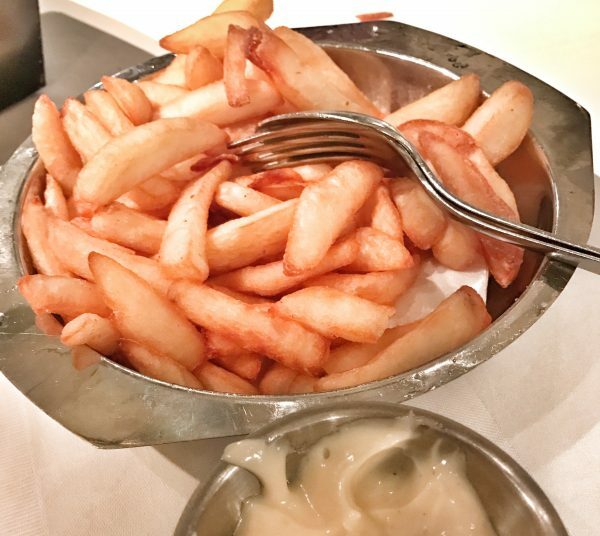 Try their fries and you die! Young and old, businessmen and tourists, shoppers and theatregoers… everyone feels at home here. So chic! 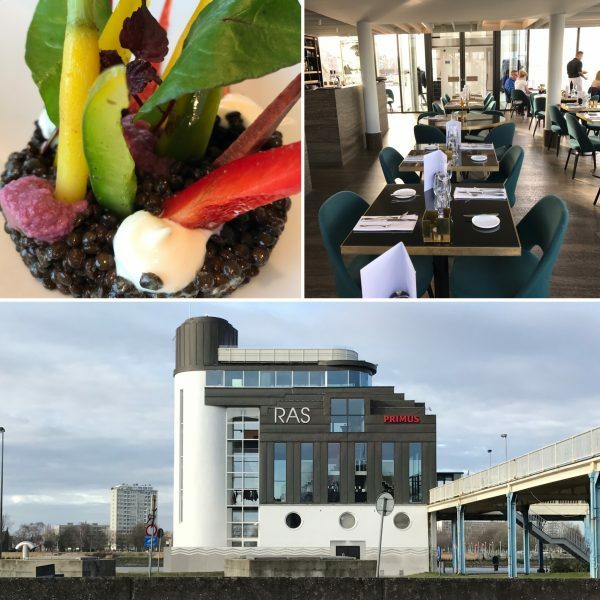 In an outstanding Antwerp setting in terms of architecture, interior decoration, art and design, lunch or dinner at RAS goes beyond food. It is an unforgettable total experience. The name drives from its location, RAS – Restaurant Aan de Stroom (the Restaurant by the River). 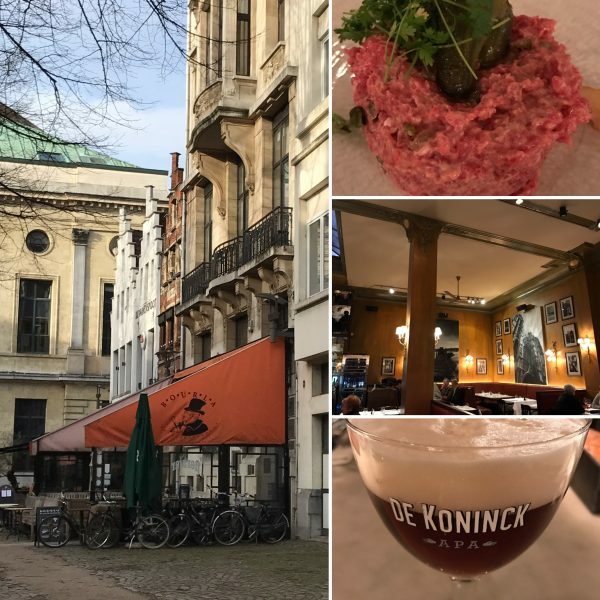 This is your first stop when you are looking for a great pub in Antwerp (there are many). 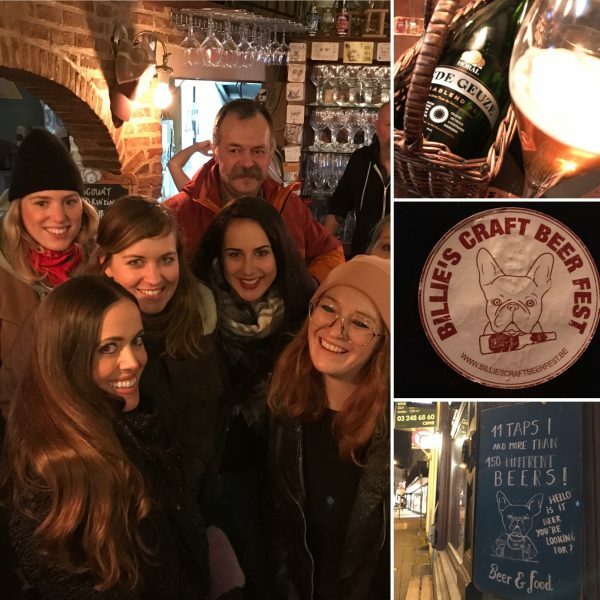 From the greatest and unknown Belgian beers to the most obscure beers from around the world, you’ll find everything here! I loved Oude Geuze, a blend of lambic from different years, served in champagne flutes. This is a must when you are in Antwerp. At Würst, Belgian television chef Jeroen Meus serves “haute dogs“, hot dogs like you’ve never tasted them before. I shared a Caesar dog and a Sauerkraut dog which were both absolutely amazing. 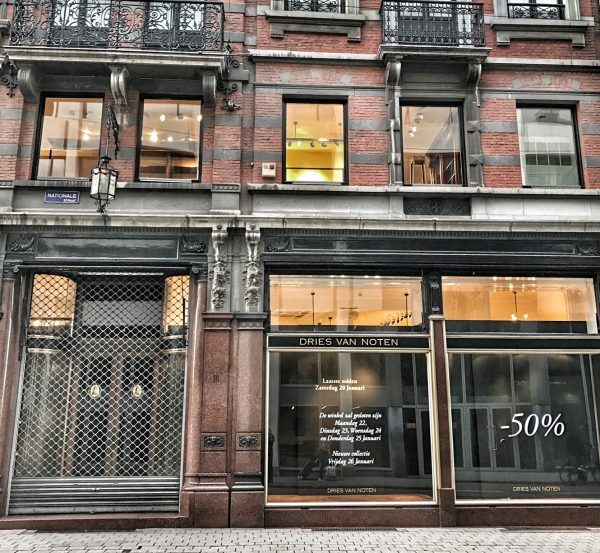 You will go bananas with the magnitude of Belgium designers having their little affordable shops around town. 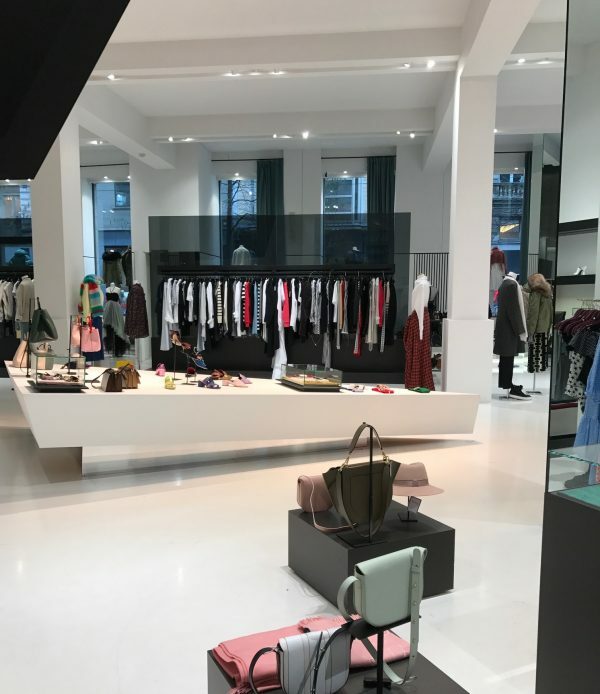 Moreover you can find many high end designer brands in Antwerp and of course, renowned Belgium designers have their flagship stores in the city, too. Personally speaking, a must when you are in town. It’s impossible to untangle the city of Antwerp from the life and work of Dries Van Noten. Unfortunately the shop was closed when I was there last week. 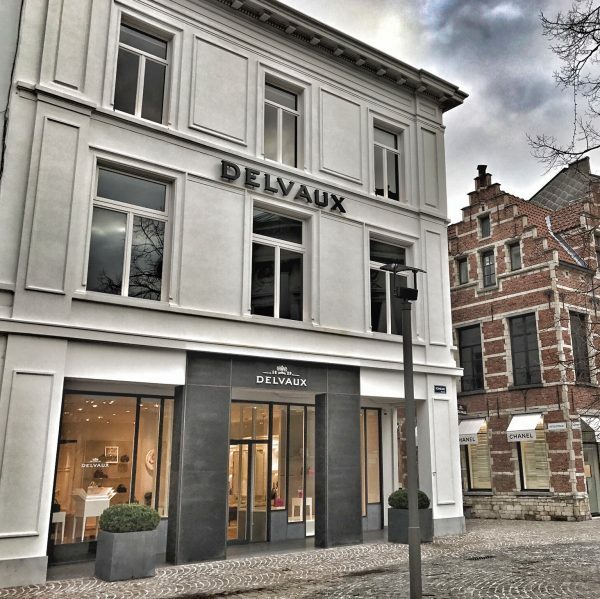 Delvaux is the oldest fine leather luxury goods company in the world, founded in 1829 in Belgium. You can find a great selection of handbags, small leather goods and accessories for women and men. The moment you enter this multibrand concept store which is across from Hotel Les Nuits, your breath is taken away. 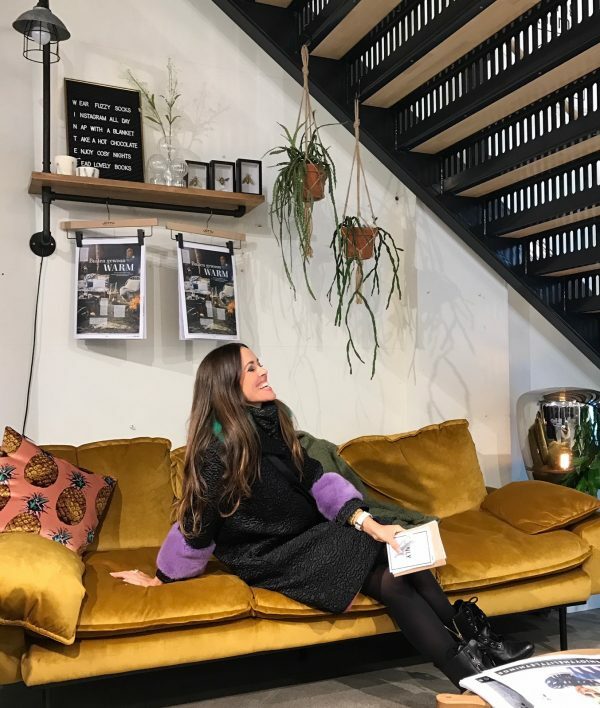 Located in a beautifully restored 16th century mansion which served as a bank before, it is a fashion heaven on earth with a great selection of many high end designers. 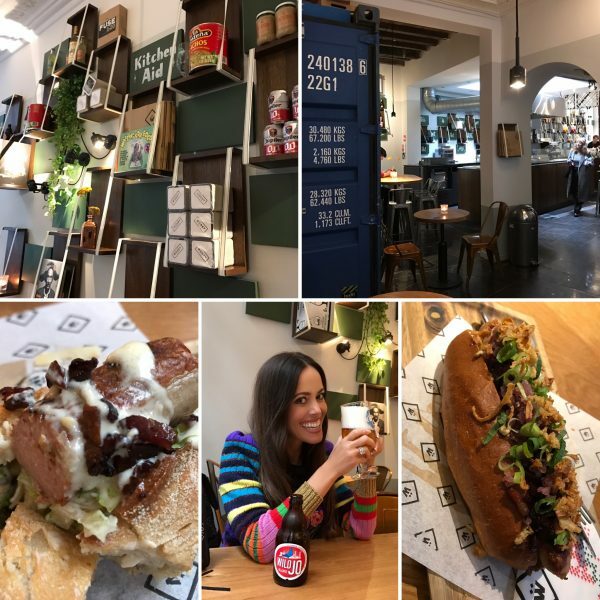 The Verso café is also worth going to. 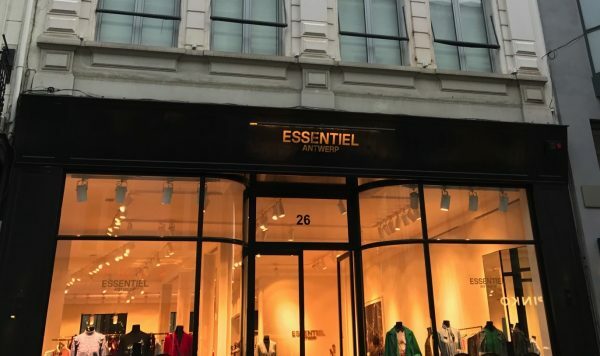 A multi brand hig end fashion store merging directional fashion with fine dining in the heart of Antwerp. Realised by acclaimed Belgian architect Glenn Sestig, the 800 sqm boutique and restaurant delivers bold statements in light, colour and atmosphere. The Belgium fashion brand delivers trendy fashion at affordable prices and has many locations in the city of Antwerp. In Switzerland available at Globus and at Limmatquai 70 in Zurich. 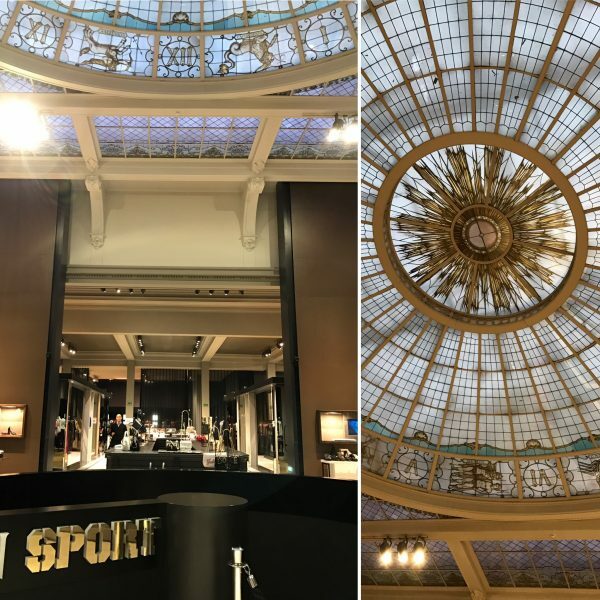 The beautifully renovated Shopping Stadsfeestzaal on the Meir is presently a shopping centre housing over fifty shops. Not my favorite for shopping, but worth seeing. 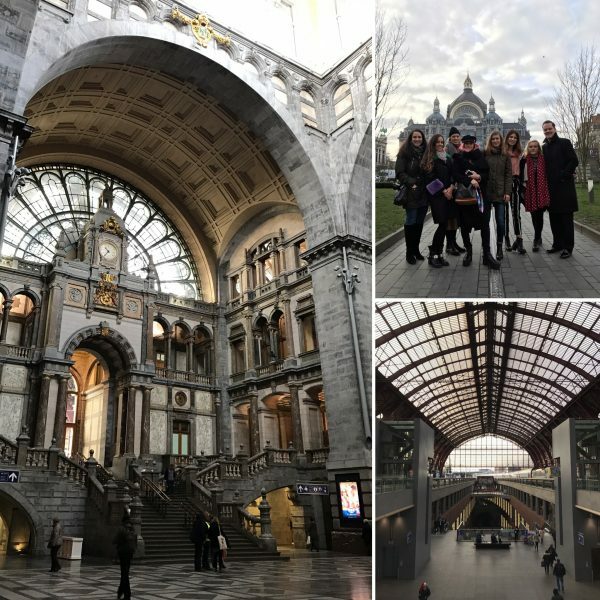 First used in 1905, this station is absolutely impressive and is considered as one the most beautiful train station in the world! Trains arrive on top of each other on three different platforms with two additional underground levels. One of the oldest and best-known zoos, it will take you at least half a day to see one of the most diversified animal collections in Europe. Antwerp has numerous museums. 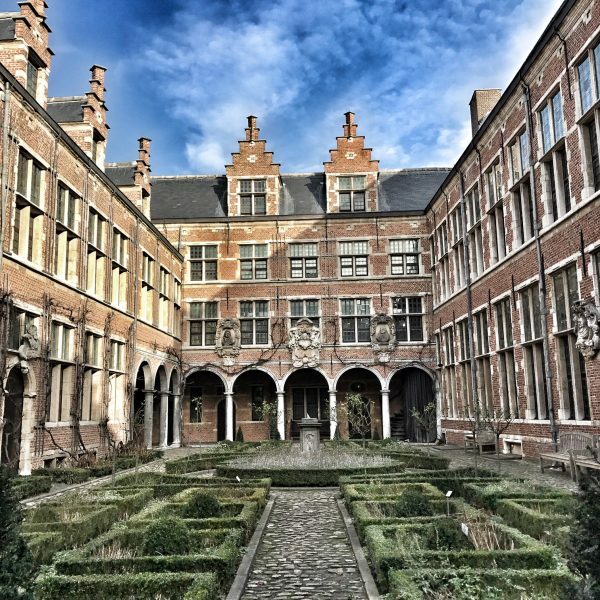 Among the best known are the Rubens House, the MAS | Museum aan de Stroom, and the Red Star Line Museum, but there are plenty of others worth seeing: historical houses where you can savour the atmosphere of past times, a fashion museum and several art museums. There is something for everyone, whatever your taste. As I was on a Monday in Antwerp, museums were unfortunately closed. My favorite would have been the MOMU Fashion Museum. 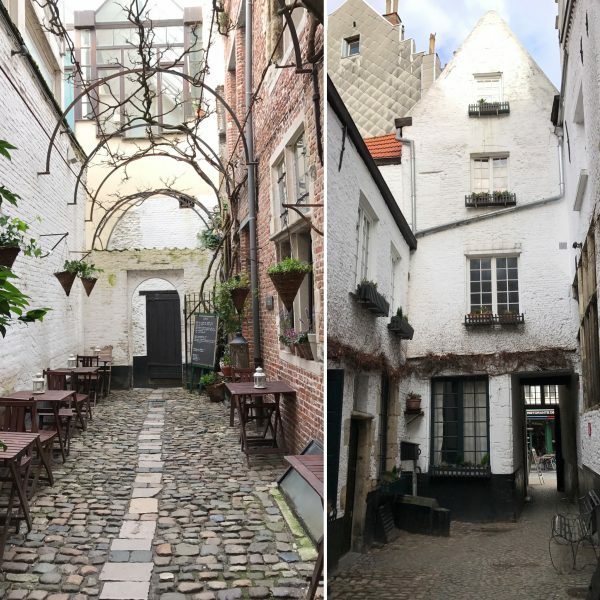 The secret Vlaeykensgang alley dates from 1591 and connects Hoogstraat, Oude Koornmarkt Pelgrimstraat with one another. Walk through the gate at Oude Koornmarkt 16 and you feel as if you have journeyed back in time. Grote Markt originally was a forum or square just outside the medieval residential quarter. In 1220 Duke Henry I of Brabant (1165-1235) donated this community land to the city. The name Merckt was used for the first time in 1310. After 169 years of construction the cathedral of Antwerp finally dominated Antwerp’s skyline in 1521 with a height of 123 metres. 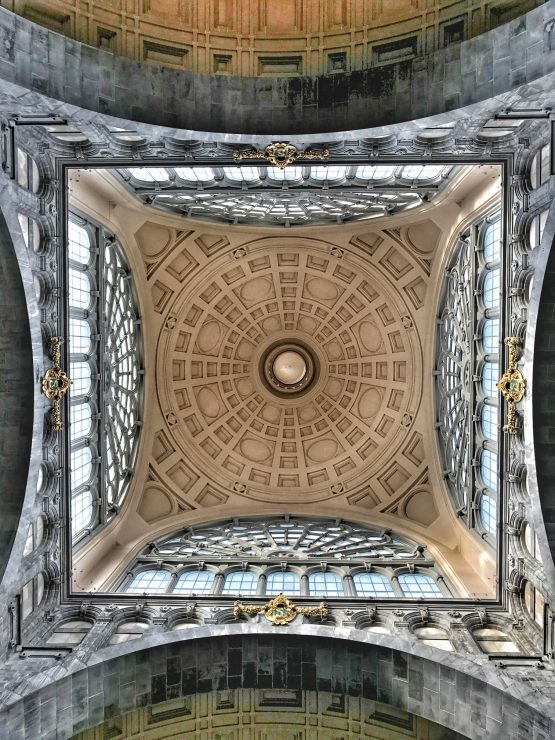 It’s the highest Gothic building in the Low Countries.It is an iconic treasury, with an impressive collection of major art works, including a series of paintings by Rubens. 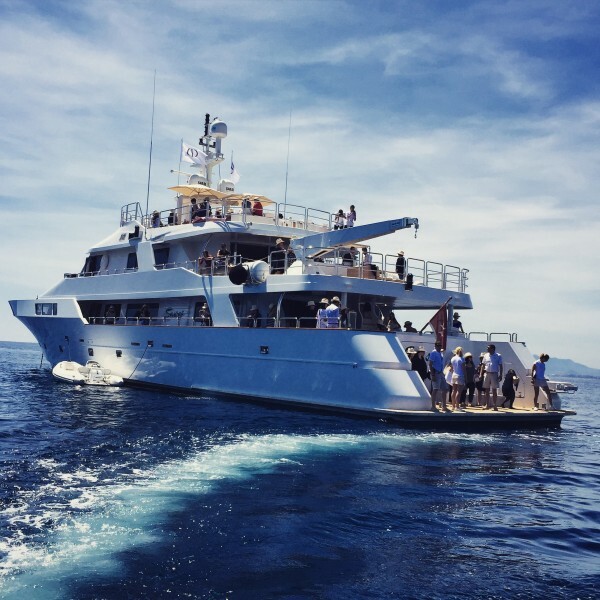 Having the most exclusive sightseeing tour thanks to Tanguy Ottomer. 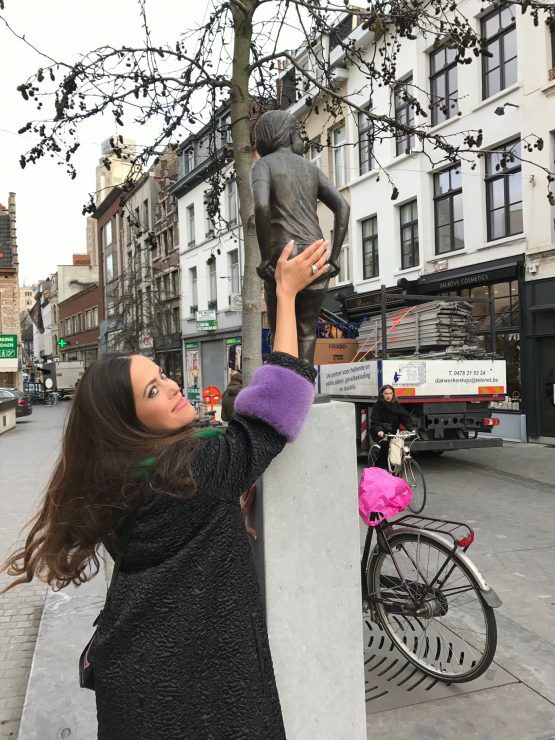 The story of the young boy Nello and his dog Patrasche is famous all over the world and it’s set… in Antwerp! 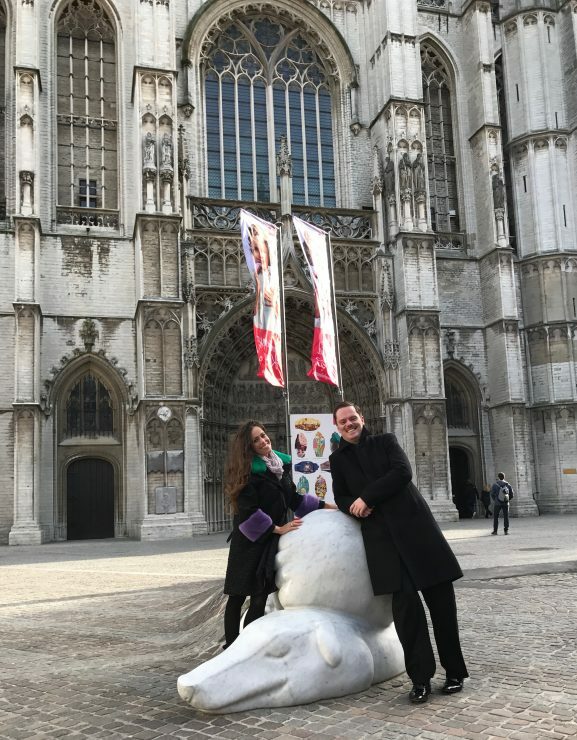 Nello and Patrasche are the main characters in the 1872 novel «A Dog of Flanders» in which the Cathedral of Our Lady and various paintings by Rubens play an important role. Nello, a poor orphan boy, becomes friends with Patrasche, an abandoned cart dog. They walk to town together every day. They often visit the cathedral, where Nello admires the paintings by Rubens. Due to a series of setbacks, the lives of Nello and Patrasche end in that same cathedral. They die together from hardship. This moving and atypical Christmas story holds a message of pride and unconditional friendship and is very famous in Japan. Artist Batist Vermeulen (‘Tist’) designed a statue of the boy and his dog which you can admire on the Handschoenmarkt, in front of the cathedral. Brussel’s Manneken Pis‘ companion in Antwerp is called Den Deugniet and is a pretty naughty statue that can be found at the corner of the Oudaanand Korte Gasthuisstraat to show his bare bottom to people passing by. It was first placed there in the ’70s by local traders and has since been kidnapped several times! Now the bottom is not gold anymore but you can still rub it for good luck. 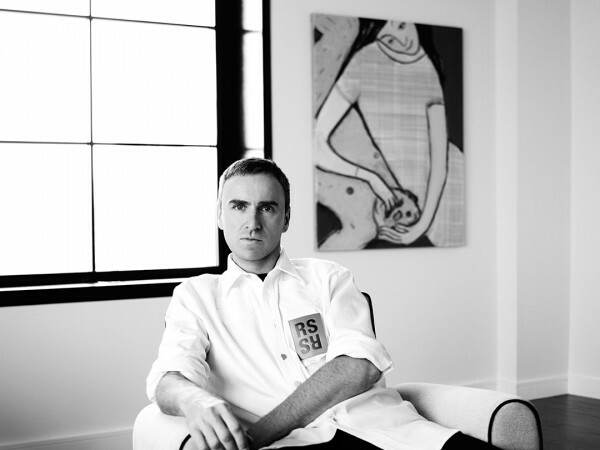 Long-running rumors in the industry have been finally confirmed today: RAF SIMONS has been formally appointed as Chief Creative Officer at Calvin Klein, filling the vacant position left by Francisco Costa in April. 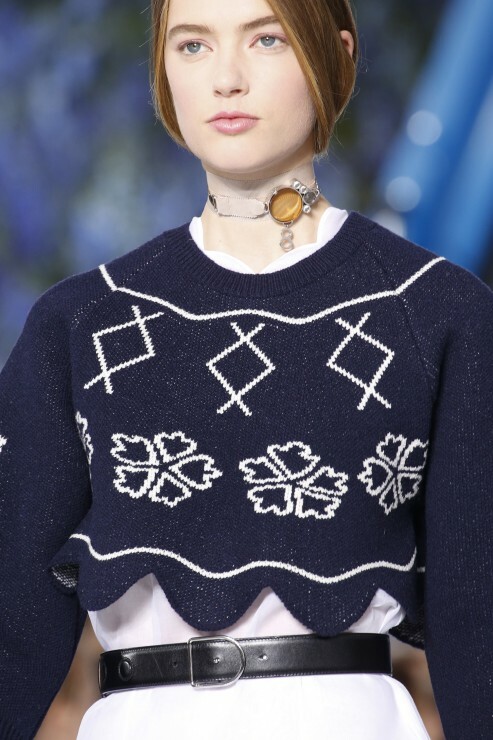 It is said that the American brand and Simons have been unable to make any announcement due to the year-long non-compete clause in Simons’s Christian Dior contract that came to an end last month. Mr. Simons will lead the creative strategy of the Calvin Klein brand globally across the Calvin Klein Collection, Calvin Klein Platinum, Calvin Klein, Calvin Klein Jeans, Calvin Klein Underwear and Calvin Klein Home brands. As part of his role as Chief Creative Officer, Mr. Simons will oversee all aspects of design, global marketing and communications, and visual creative services. Mr. Simons’ first collections will debut for the F/W 2017 season. The appointment of Mr. Simons as Chief Creative Officer marks the implementation of Calvin Klein’s new global creative strategy, announced in April 2016, to unify all Calvin Klein brands under one creative vision. 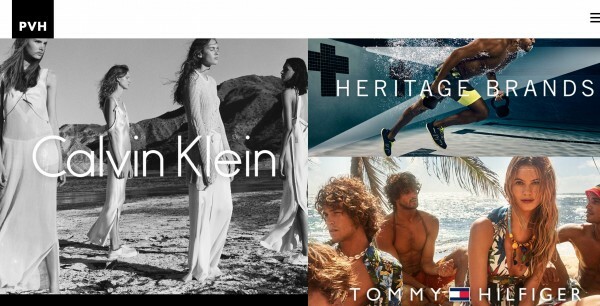 The strategy comes as part of a global evolution of the Calvin Klein brand, which began with the reacquisition of the Calvin Klein Jeans and Calvin Klein Underwear businesses in 2013. As Calvin Klein looks to grow the brand to $10 billion in global retail sales, this new leadership is intended to further strengthen the brand’s premium positioning worldwide and pave the way for future long-term global growth. 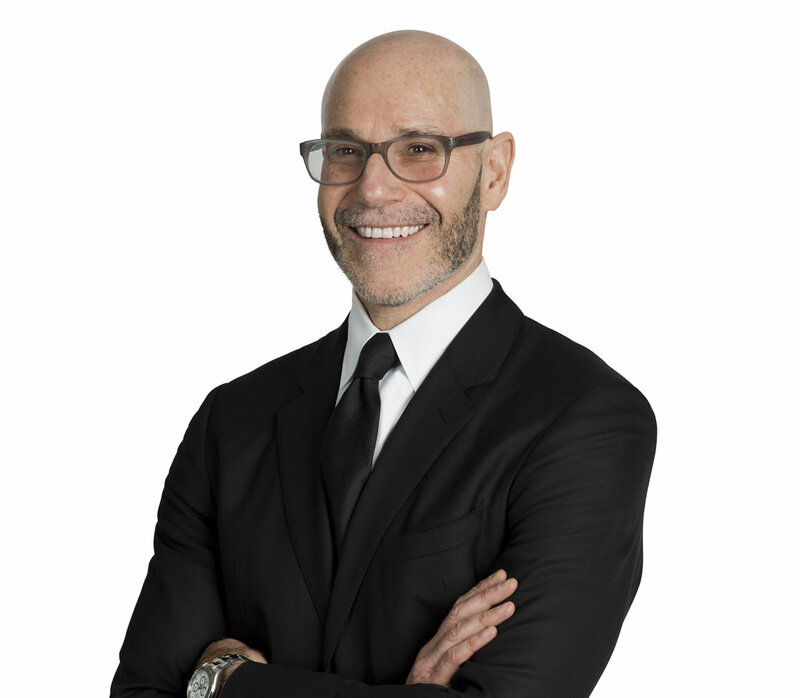 Steve Shiffman, CEO of Calvin Klein, Inc.
As part of the creative strategy for the apparel and accessories business, Calvin Klein also announced the hire of Pieter Mulier as Creative Director, reporting directly to Mr. Simons. Mr. Mulier will be responsible for executing Mr. Simons’ creative and design vision for men’s and women’s ready to wear, as well as the bridge and better apparel lines and accessories. He will also manage all men’s and women’s design teams within the Calvin Klein brand, under Mr. Simons’ leadership. Calvin Klein, Inc., a wholly owned subsidiary of PVH Corp. [NYSE: PVH], is one of the leading fashion design and marketing studios in the world. It designs and markets women’s and men’s designer collection apparel and a range of other products that are manufactured and marketed through an extensive network of licensing agreements and other arrangements worldwide. Product lines under the various Calvin Klein brands include women’s dresses and suits, men’s dress furnishings and tailored clothing, men’s and women’s sportswear and bridge and collection apparel, golf apparel, jeanswear, underwear, fragrances, eyewear, women’s performance apparel, hosiery, socks, footwear, swimwear, jewelry, watches, outerwear, handbags, small leather goods, and home furnishings (including furniture). With a heritage going back over 130 years, PVH Corp. has excelled at growing brands and businesses with rich American heritages, becoming one of the largest apparel companies in the world, having over 30,000 associates operating in over 40 countries with over $8 billion in 2015 revenues. Among the brands are Calvin Klein, Tommy Hilfiger, Van Heusen, IZOD, ARROW, Speedo, Warner’s and more. 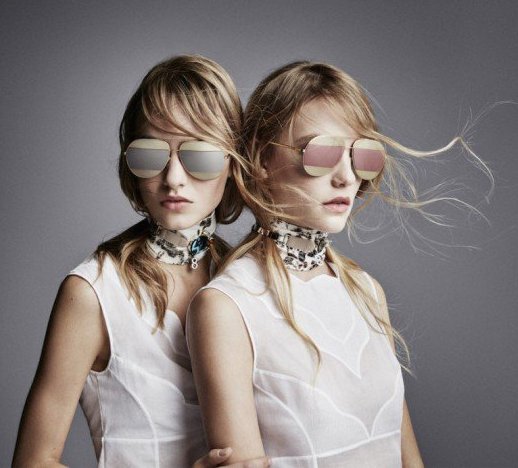 Here they are, DIOR SPLIT – the new must-have sunglasses from the House of Dior. Reinventing the classic aviator shape in a graphic style, they are designed with different mirror effect stripes on the lenses. First presented against a sea of blue delphiniums that embellished the S/S 2016 set of Raf Simons last runway show for Dior. 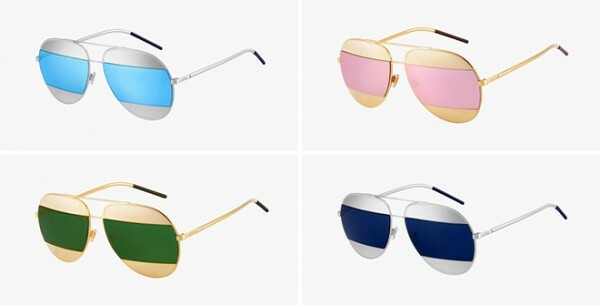 Thanks to Safilo, I was able to get my hands on the new shades and went for the yellow gold with green version. It is very funny feeling when you put them on for the first time as the separation of the lenses can be felt and you literally look through a box. This distraction goes away pretty easily and your eyes get used to the effect. Available now for € 430.00. Click here to visit the website. 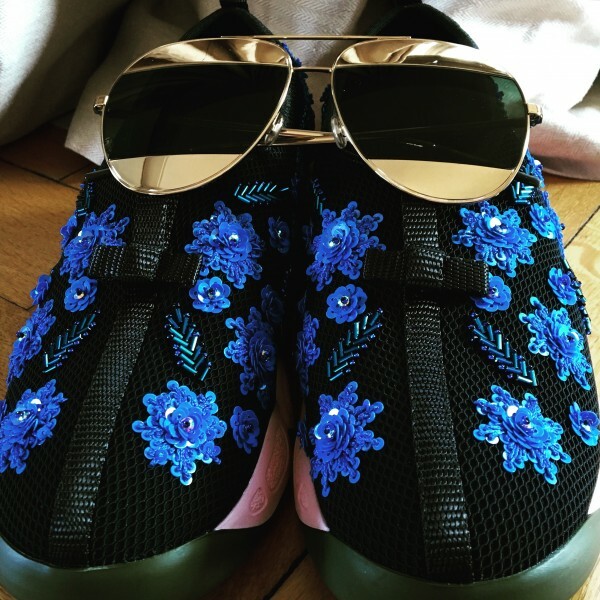 Perfect match: my new Dior Fusion sneakers and the Dior Split sunglasses. Thanks, Dior, for spoiling me! 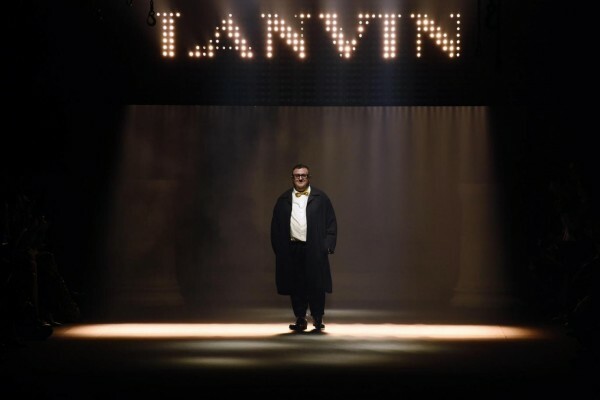 No word so far on Alber’s next move, but one thing is for sure after Simons it’s another high-profile fashion departure in a week and it puts Elbaz in a premium position to be considered for the Dior post. I think that it would be a perfect match! 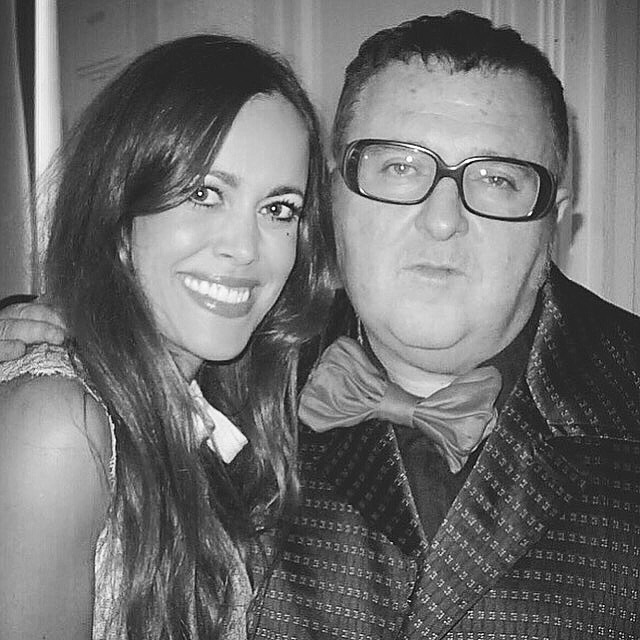 Alber Elbaz with me in Paris a few weeks ago. Now, it is a good time to shop the latest designs by Alber Elbaz for Lanvin. I put a great outfit together for you. 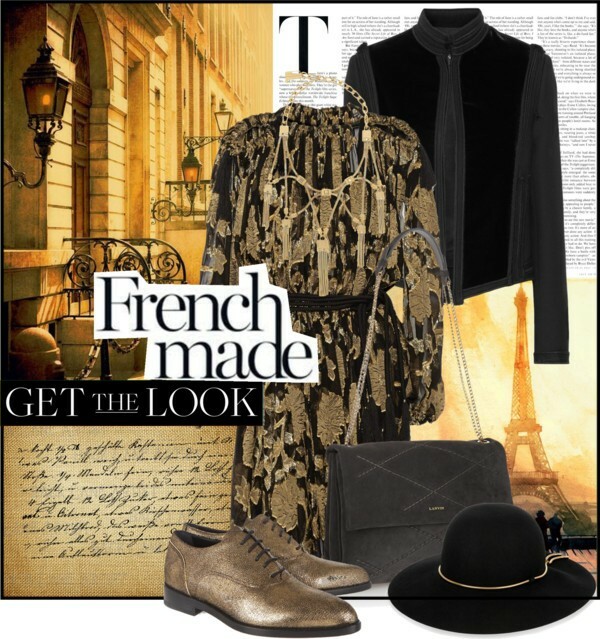 Get the look: Embellished velvet and wool-gabardine jacket, cutout metallic fil coupé chiffon mini dress, metallic suede brogues, Sugar medium quilted suede shoulder bag , tasseled gold-tone crystal necklace and snake chain-trimmed rabbit-felt hat, all by Lanvin. This is one of those days. I am totally jet-lagged as I just got back from New York City and in between travels which means emptying one suitcase and filling the next one. I hoped for an relaxing evening on the couch when I heard the big and very unexpected news that I had to get out to you in case you haven’t read it yet. 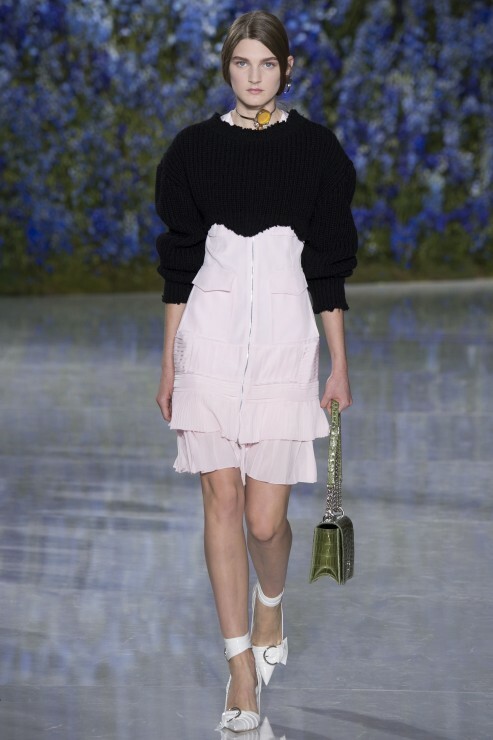 After three and a half years as Creative Director at Christian Dior, fashion designer Raf Simons has announced today that he will be leaving the French Maison. 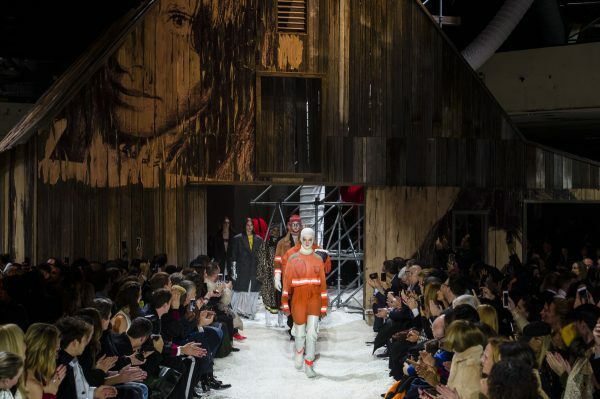 His S/S 2016 collection he showed during Paris Fashion Week in the beginning of October will be his last. It will be interesting who will succeed Simons as ​Dior’s sales increased dramatically under him. I truly loved what he did. Tomorrow I will be on a trip with Dior ​so let’s see if I can get some insights. 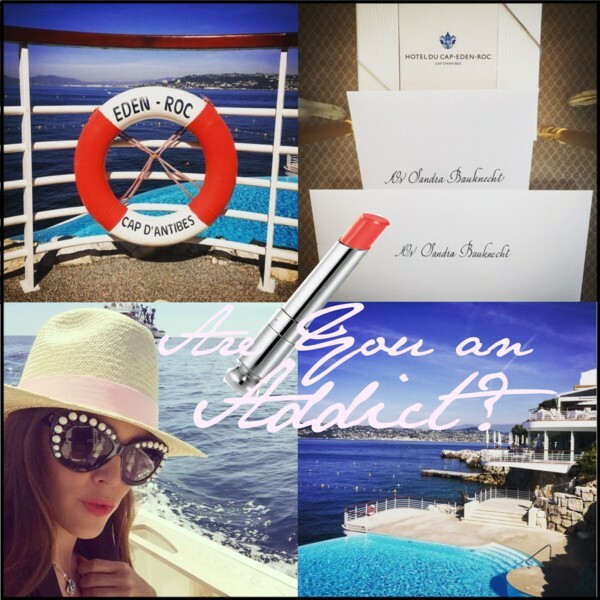 Spring time at the Hotel du Cap-Eden-Roc, the perfect backdrop for Dior to present their upcoming launch, the first lipstick created by their new Creative and Image Director for Dior Makeup Peter Philips who gave me a very exclusive and rare interview (available in German and French in the new October issue of L’Officiel Switzerland – at newsstands nationwide this Thursday). 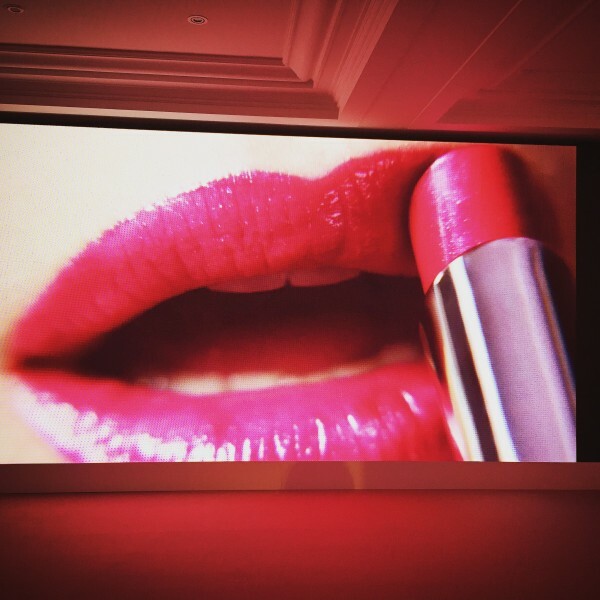 Since its launch in 2001, the «Dior Addict Lipstick» has been on everyone’s lips. The first lipstick created as a fashion accessory has been reinvented this fall in a futuristic version, defying the limits of shine to ensure easy-to-wear, lively and vibrant colour in one movement with no mirror needed. Thanks to its hydra-gel core, that is composed of 40% of the three of the shiniest oils used in cosmetics, it is the first lipstick with an integrated top coat. With each application, this original gel coat delicately melts over the lips, providing them with a sensual moisturizing glossy film and a spectacular volumizing effect. No lip balm needed anymore. Basic Instinct: Jennifer Lawrence in the new campaign. Time to meet this icon of the beauty industry. Born in Antwerp in Belgium, Peter Philips is the former Creative Director of Chanel Makeup. 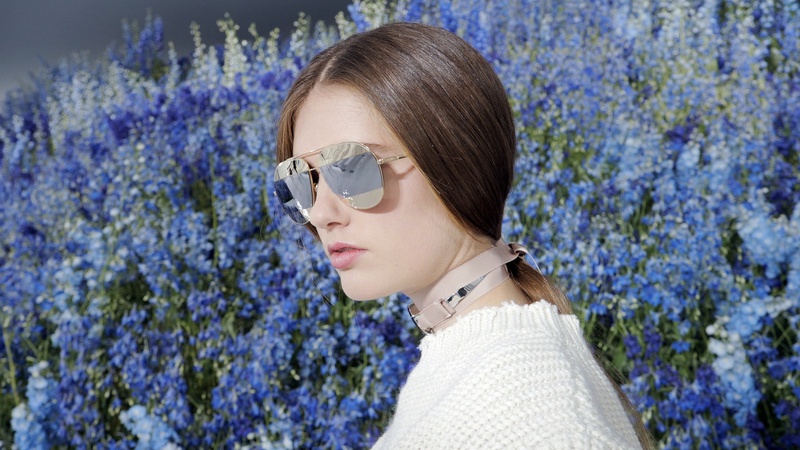 After having left in 2013, he spent the subsequent year as a freelancer before joining the House of Dior. 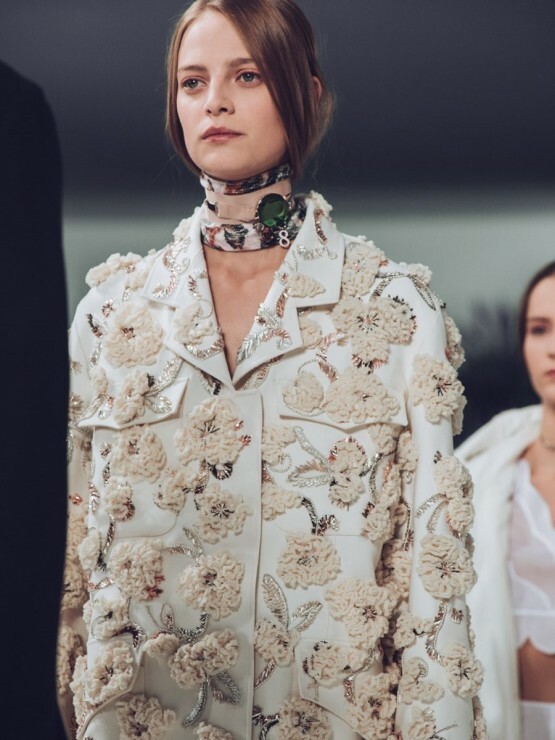 Working along with his fellow countryman and longtime friend Raf Simons, Creative Director Dior, the two share the same aesthetics and vision. The perfect match! The lipstick as a fashion accessory – what does that mean to you? I talk about the origin of the object, the way it is shaped is different from any other lipstick. It is pretty to put in your handbag, just like a fashion accessory. When you create makeup looks, do you take it from a fashion and trend angle or you think more about the wearabilty of the products? As a makeup designer my first motivation is beauty. That is my main reason. Once you start talking trends in makeup, it becomes fashionable but this is just a niche. Clearly all women want to be beautiful. 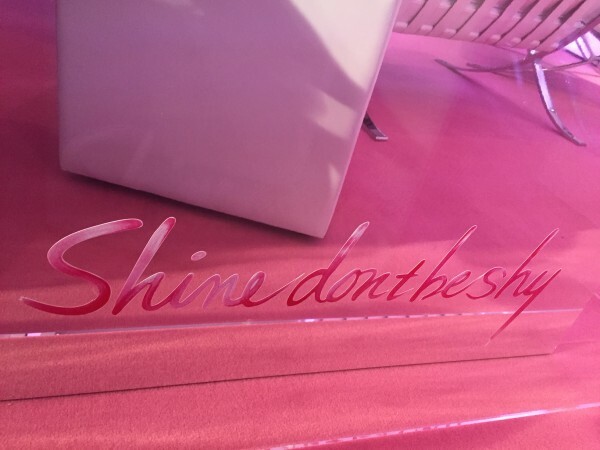 Not everyone wants a trendy shade, but everyone wants a pretty shade. So first, I am guided by beauty and then I use fashion to make it more interesting, to tease and link it to couture, to editorials and shows. Getting spoilt. Lunch on the boat for the launch event of Dior Addict Lipstick. How do you work together with Raf Simons? Our creative process is about looks, not about collections, not about products. Practically, we have a different timing. Raf works now on couture and the show will take place in one and a half month. I am working one and a half year in advance to design new makeup products. Therefore it is so important for me to be guided by beauty as I can always integrate the fashion part later. When I work with Raf, I create a look for his show and use my products as a service to enhance Raf’s vision and to deliver his message. The ad campaign reminds me so much of that famous scene in Basic Instinct. Is this on purpose? Yes, it comes with these cinematographic references and it is just a flash. With Jennifer Lawrence, we have got an actress and she loved the movie. It is visually a nice teaser. It shows a strong woman and is a nice «clin d’oeil» to another Dior icon, Sharon Stone. Can you give us some tips how to apply Dior Addict Lipstick? It is such an easy product. Most important is to find the right shade or shades according to your mood. 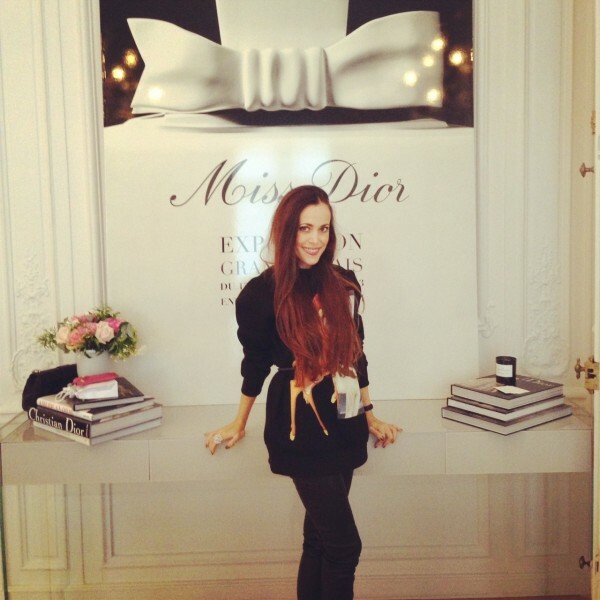 «Be Dior» for example suits a lot of women. You can even only apply it in the middle as it is sheer and you can build it up as you like. 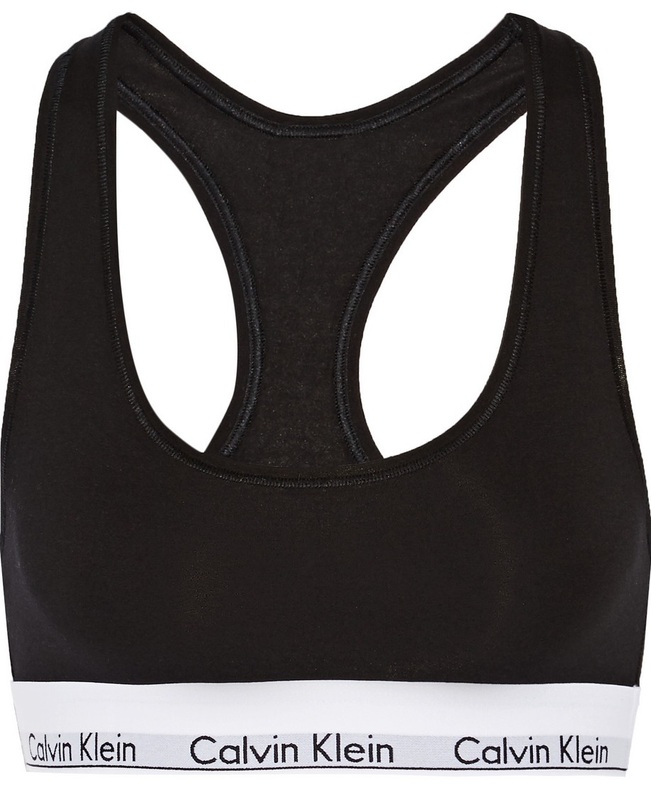 It gives a lot of moisture and comfort. You don’t need to use a primer, a liner or a balm. All the tricks are in this one lipstick. How do we find the right shade? This is hard to say. It is the same for every beauty product, for eye shadows, foundation, nail polishes, you have to try it because there is no manual for it. I recommend going to a counter and feel it. Therefore I don’t believe in buying over the internet for the first time. And do not forget to look at the colours in different lights. 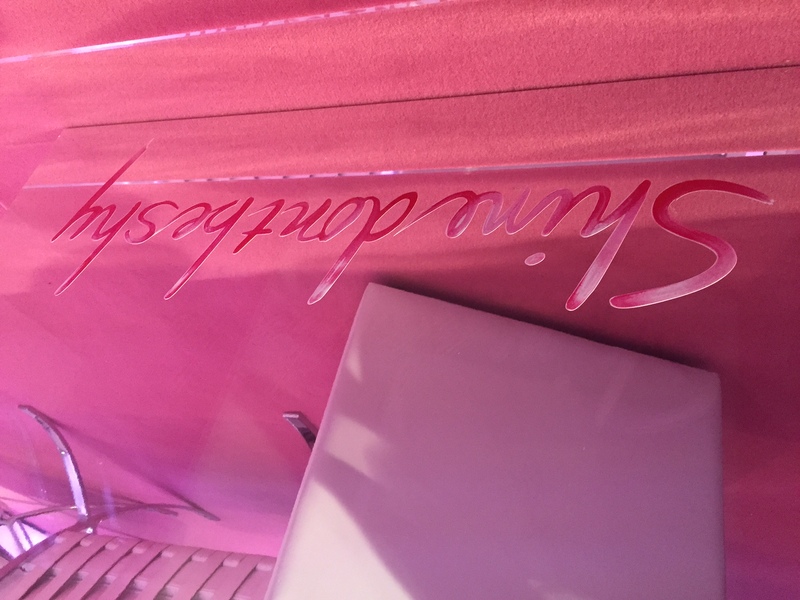 For example, the new Dior Addict Lipstick shades shine in the sun like fireworks. 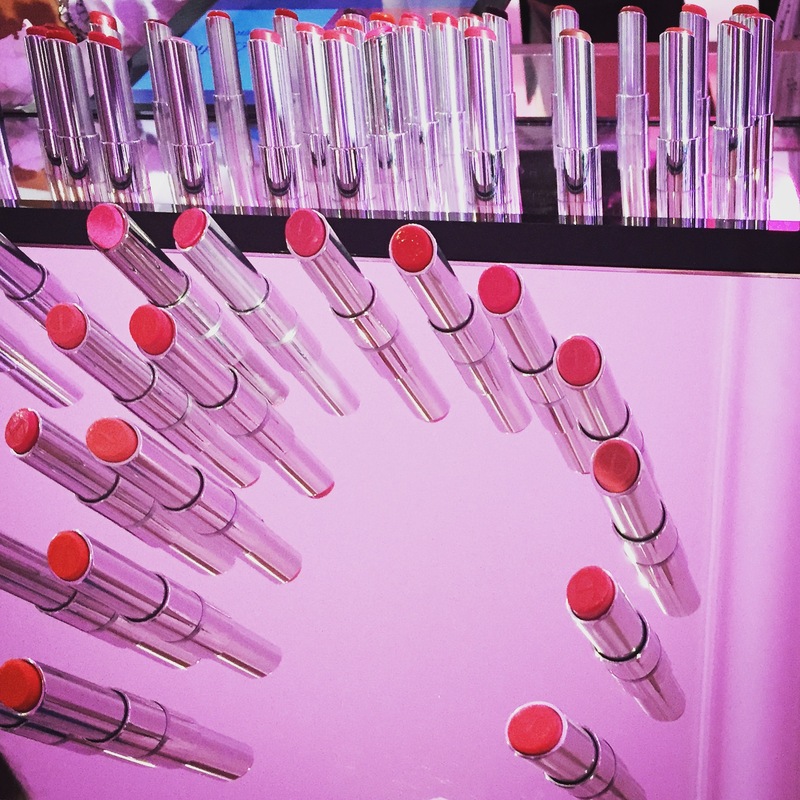 How can we make lipstick long-lasting? For shoots and in general, I like to scrub the lips to get rid of the dead skin, I moisturize the lips preferably with Lip Maximiser but it can be any lip balm to nourish them. Very important is it to take the greasiness away and to dab off the excess before getting started with applying the colour. For a classic lip, I recommend a liner, maybe fill in the whole lip and apply the lipstick afterwards. If you would like to have a lip stain, just pinch it in with the fingers so that it will last. The new Dior Addict Lipstick comes already with an integrated top coat that seals in the colour and makes the pigments stay longer. What are the beauty products every woman should own? Each woman should find the right foundation if she needs it. If you have great skin, do not even bother to get it, just maintain it. A foundation should give the illusion of a youthful skin. If you have it, do not change it. Actually I am wearing «Star Foundation» right now because I got a huge sunburn. An eyelash curler is a must for every woman. Even if you do not wear makeup, curl your lashes as it will open your eyes immediately. But never apply it when you have mascara on as the lashes might break. 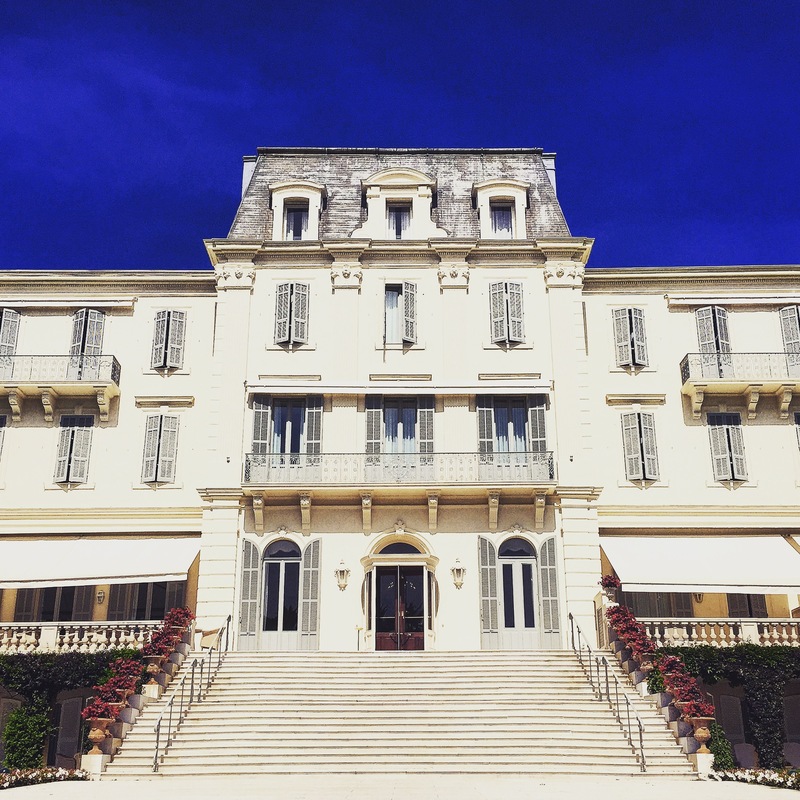 Best location to host a launch event: The beautiful Hotel du Cap-Eden-Roc. As I said before, I am guided by beauty. I like to create products that are really useful and surprise with interesting elements, such as new textures or different shades. I don’t want to dictate. The women who wear my makeup should discover the products themselves and have fun with them. When I work for a fashion show, my signature is that I am very loyal to the designer, to support him and not to make it my show. Therefore they like working with me. I like to stay low profile but if they want something spectacular, I can deliver it. Why did you take the job at Dior? After I left Chanel, I worked for one year as a freelancer and I realized that I missed creating the products. I know Raf for 20 years and kept doing his menswear shows. One day, he came to me and said: «You stopped so that you can do my shows now?» He booked me and so from one thing came another. 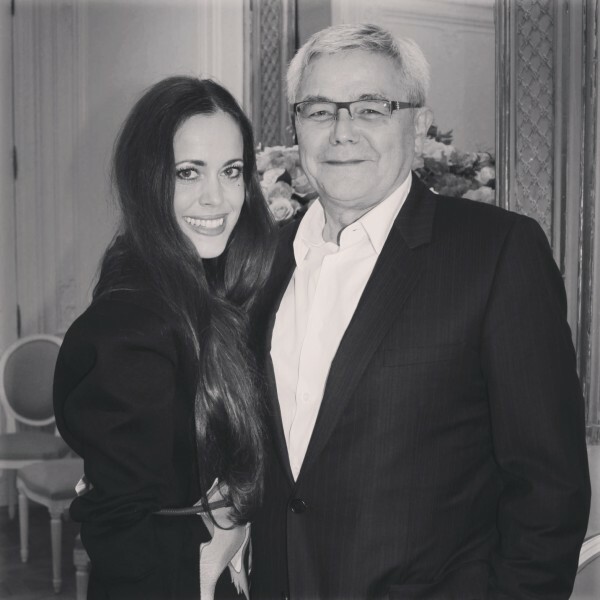 I got to meet Claude Martinez, Chairman and Chief Executive Officer of Parfums Christian Dior. Funnily enough, I was not sure if I wanted to be linked again to one brand and stay in Paris. (Laughs) Probably it was midlife crisis but after one year, I truly missed doing collections and creating new products, the innovation. It was bizarre going to a store and buy products again that I needed for my work. I had a very critical eye and simultaneously Raf came in. Now, I am happy to be part of this amazing House that has a different DNA than the one I worked before at. We already shot the campaigns for S/S 2016. Autumn and Christmas is almost done and I will be shooting those ads for F/W 2016 during the next weeks. To make a living by doing makeup. The big variety of my job. Doing shows, products, shoots and working with the labs, even that technical part interests me. I don’t see myself as an artist, but I can be very creative. I like to watch women wearing my shades and products. Working also with a movie star who wants to put me in her bag and travel around with me makes the whole package just great. As a journalist you get to meet a lot of people but it is always a pleasure to talk to someone who has such a passion for his job like Peter Philips. 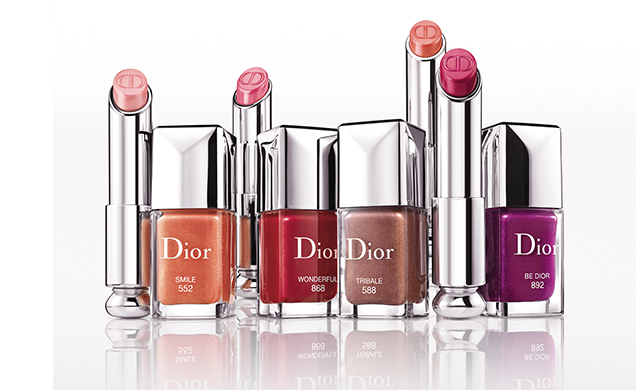 After having tried the new «Dior Addict Lipsticks», I can understand his excitement and I have a confession to make. I have become an addict and I cannot get enough. And you will surely, too! 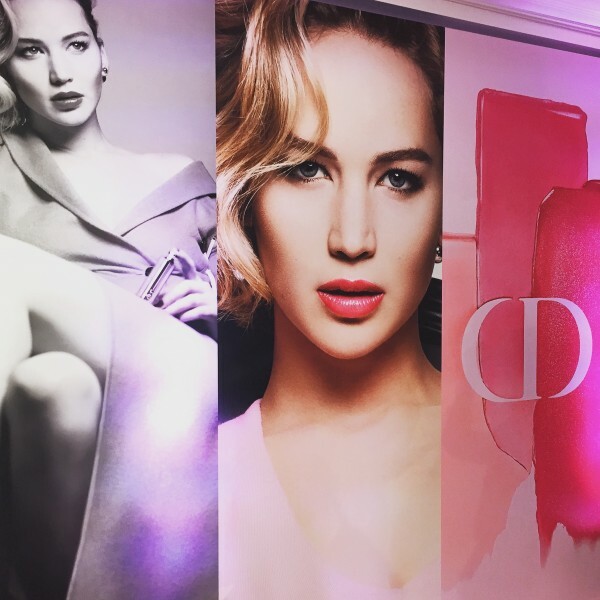 4 It-shades: Be Dior (Jennifer Lawrence wears it in the campaign), Smile, Tribale and Wonderful are also available as Dior Gel Coats. The collection is in stores now. 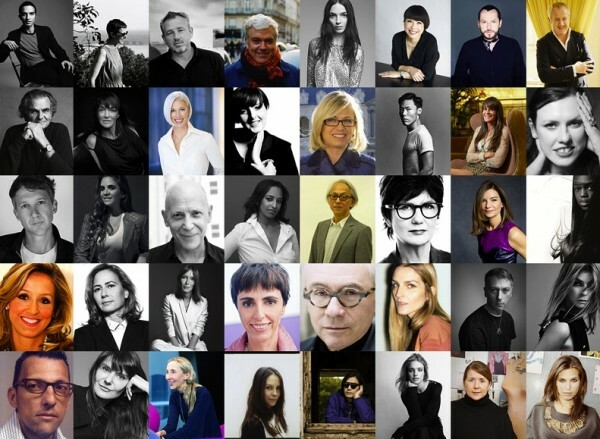 Forty internationally renowned experts from the world of fashion (among them Jefferson Hack, Katie Grand, Natalie Massenet, Carine Roitfeld and Patrick Demarchelier to name a few) are to meet thirty applicants to the LVMH Prize during Paris Fashion Week. They will select a short-list of ten young designers who will go forward to present their work to the jury in May 2014. Entries have already been received from all over the world, including Asia, Africa and South America as well as the United States and Europe, with many more anticipated before the closing date of February 2nd, 2014. 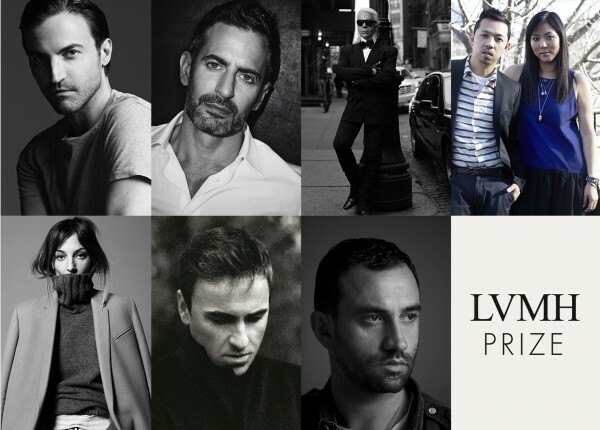 The members of the jury for the first edition of the prize in 2014 are eight creative directors from LVMH Fashion Houses including: Nicolas Ghesquière (Louis Vuitton), Marc Jacobs (Marc Jacobs), Karl Lagerfeld (Fendi), Humberto Leon and Carol Lim (Kenzo), Phoebe Philo (Céline), Raf Simons (Dior) and Riccardo Tisci (Givenchy). The designers will be joined by Delphine Arnault, Jean-Paul Claverie (advisor to Bernard Arnault and head of corporate philanthropy for LVMH) and Pierre-Yves Roussel (Chairman and CEO of the LVMH Fashion Group). YOU CAN APPLY HERE! Good luck! Who Are You, Miss Dior? Christian Dior was a visionary. Beginning with his first collection in 1947 he rewrote the rules of modern elegance and imposed his style on the entire world. He brought women his vision of beauty and happiness. He showed unprecedented creative originality. 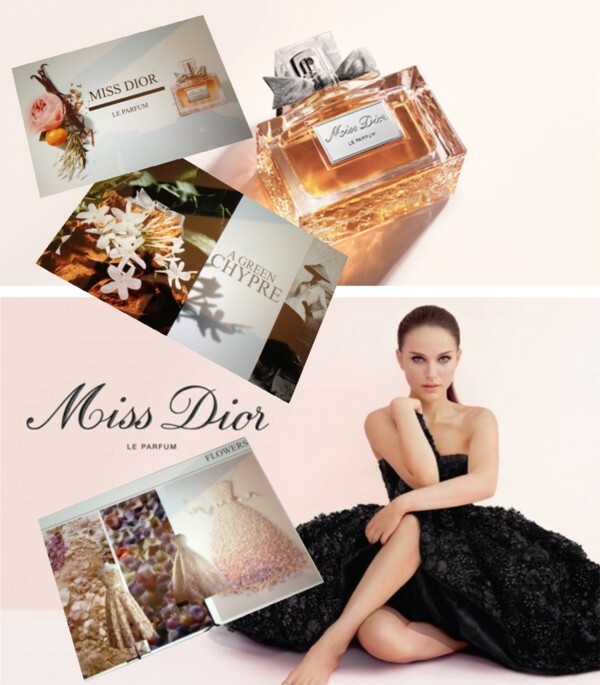 In a dress embroidered with thousands of flowers designed by Raf Simons, Natalie Portman reveals a new facette of Miss Dior – Le Parfum, which I was able to explore in detail before the grand opening of the exhibition at the Grand Palais dedicated to this iconic scent. Me in my beloved Bambi print neoprene sweatshirt by Givenchy, belt by Bottega Veneta and stretch-leather skinny pants by Gucci. 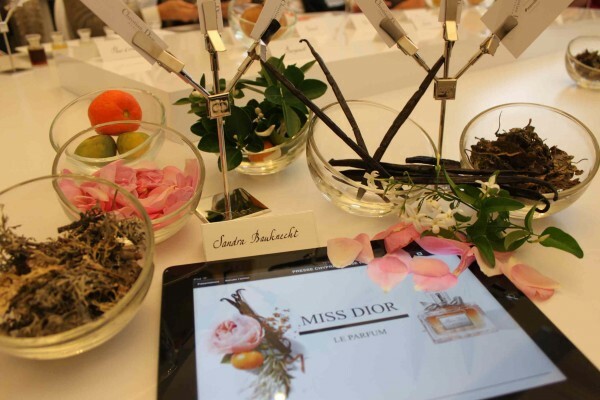 Miss Dior is a green chypre, the world’s first. When it appeared in 1947, its construction was unique, a masterful balancing act of notes: the citric from a citrus fruit, the floral drawn straight from the garden, and then the woody notes of patchouli and oak moss. 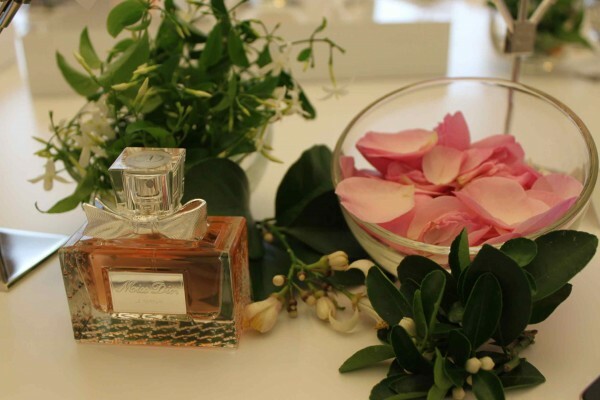 “When Miss Dior was created in 1947, it was a perfume unlike any other. 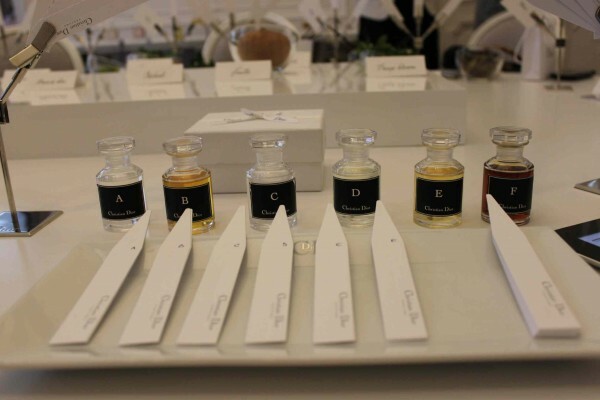 The green chypre was known at the time, but no one had succeeded in developing the green note in the chypre in a way that produced an harmonious result,” explains François Demachy, Dior’s perfumer-creator. 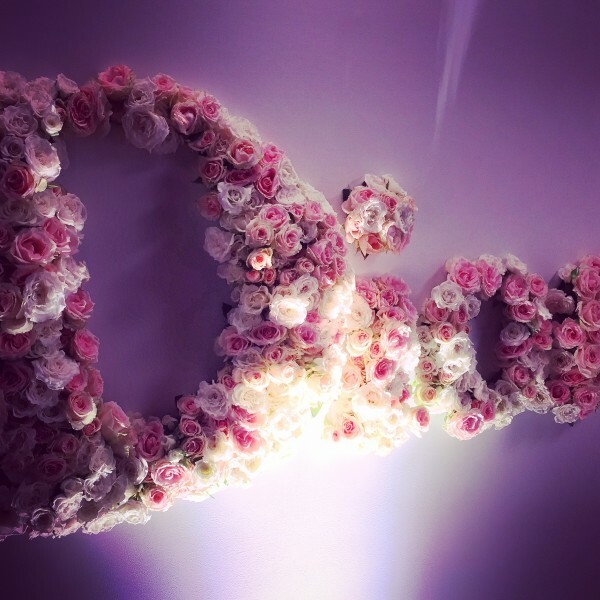 Miss Dior is a family and its various accords depend on the compositions, on the different raw materials with which they’re made. 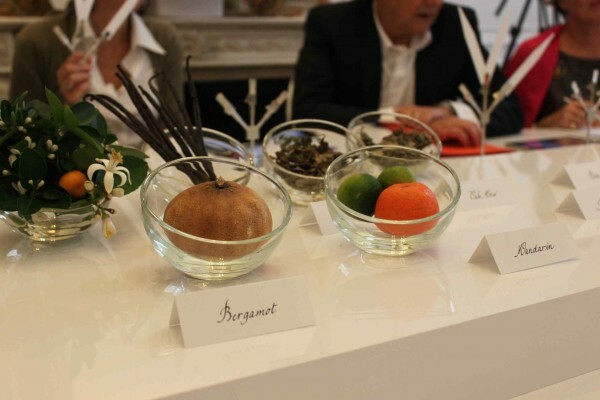 Thus, the citrus is expressed by a neroli (in the Eau de Toilette), a Sicilian mandarin (Eau de Parfum and the Parfum) or a Calabrian bergamot (Eau Fraîche); then jasmine, ylang-ylang and rose alternately form the fragrance’s floral bouquet; with oak moss, sandalwood, vetiver or patchouli writing the woody notes. ” Miss Dior is a highly codified succession of materials that in themselves have nothing in common. 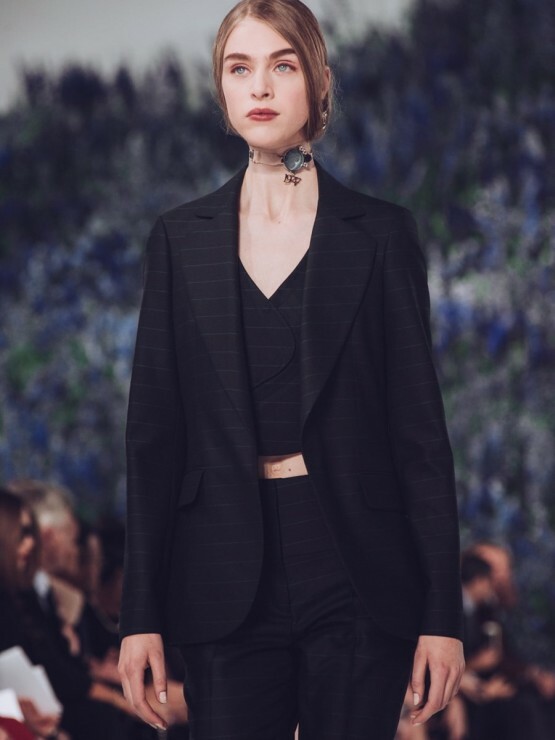 But it’s when these materials are mixed together that the fabled Miss Dior harmony is formed, the one that every woman recognizes,” François Demachy states. Regarding the name, there is a sweet anecdote. Catherine, the little sister of Christian Dior, walked down the stairs when the designer’s muse Mitza Bricard exclaimed “Miss Dior” in her unique way that made him think of the ultimate chic. Very interesting to know is that in the beginning when the perfume was launched, you could only get it if you bought a dress at Dior. Isn’t it funny how the world has changed. Today, you mostly buy into the world of Dior via a fragrance… but as Christian Dior put it: “Perfume is the finishing touch to a dress.” And again, I couldn’t agree more and Miss Dior Le Parfum definitely belongs to my favorites.